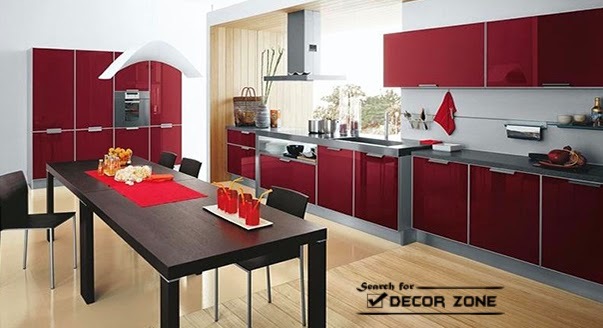 If you love red and want to use it in the interior of your apartment, the most suitable place to use it is the kitchen. 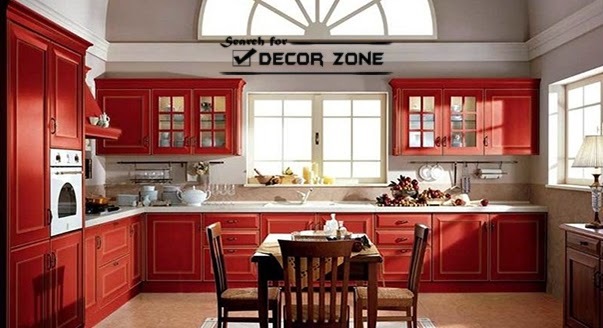 Today in Decor zone we provide you with ideas and designs of red kitchen cabinets, we also talk about what the advantages of this color and how to apply it in the design of small rooms. Red has a strong influence on the person, it excites and stimulates. Although this color is a symbol of love and passionate relationship, psychologists do not recommend using it in the family bedroom. The fact that it has too strong emotions, sometimes even aggression (because the red is the color of blood) for a long stay in a red room in many people causes discomfort and irritation, so that for a room designed for a relaxing stay, it is not suitable. 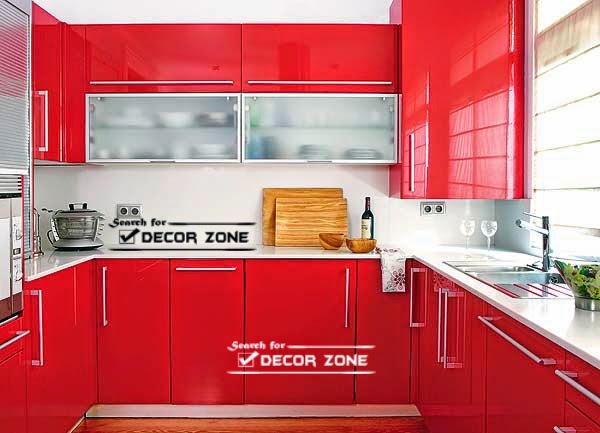 The question arises - why do not we feel uncomfortable on the red kitchen? The fact that red not only stimulates emotions, but appetite. Familiar foods that we eat almost every day - tomatoes, peppers, apples - mostly red. Just like your favorite summer fruits and berries: strawberries, cherries, watermelon, currants. Have you noticed that in grocery supermarkets with meat products showcases illuminated with red light? Do so in order that the products look appetizing and juicier. Has the same property and red kitchen cabinets - reflecting light, it makes our food more appealing. In summary, we conclude that the red in our head has a direct relationship with the familiar and delicious food. 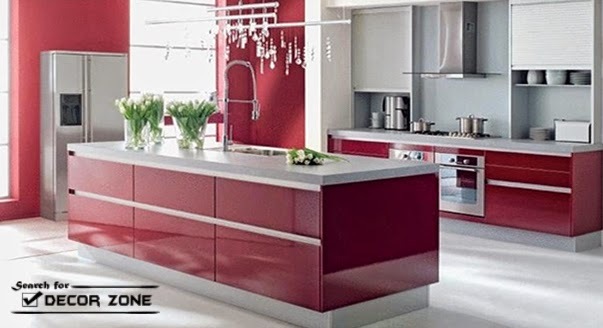 Why is red in the kitchen cabinets is not annoying? I'm not a psychologist, but the hostess, who like many women who spend a lot of time in the kitchen. 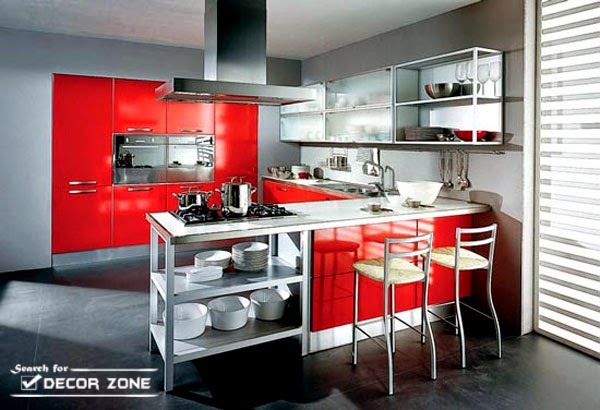 I think that the energy that the red kitchen cabinets gives us, we can easily transform it into a creative inspiration. Cooking in an emotional atmosphere always brings the best results. I wonder if this means that in red kitchen cabinets, we cook better and tastier? Perhaps you should try to give a precise answer. 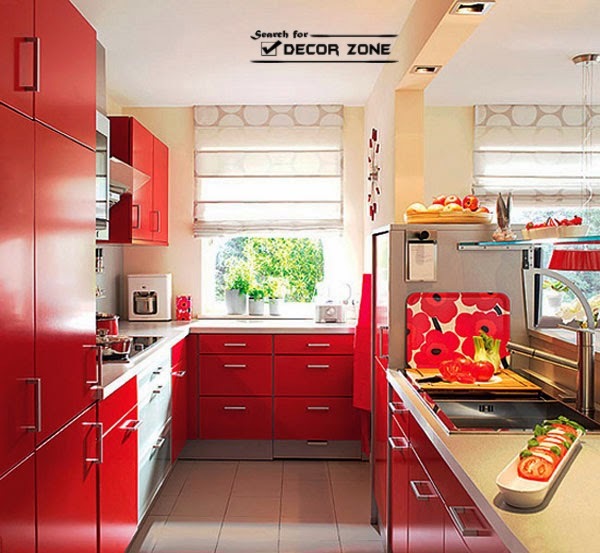 For small kitchen, red is the right solution. It is better to combine it with white. Make light floor, walls and ceiling, and the room will seem more spacious. 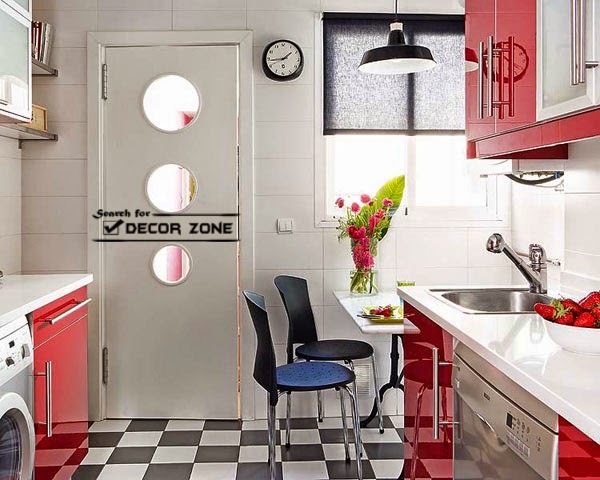 you can paint one, maximum two walls in red and buy furniture with white glossy front. Both of these options considered a good idea for a small kitchen. 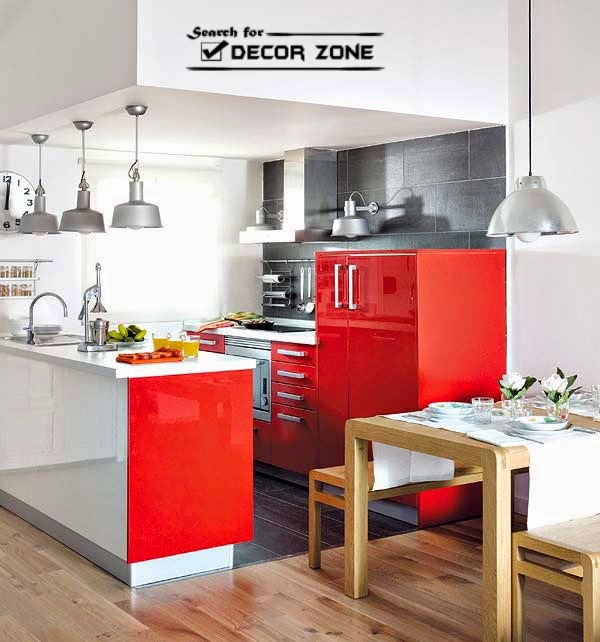 Combine any colors with a neutral gray, but it particularly still looks impressive at its red background. 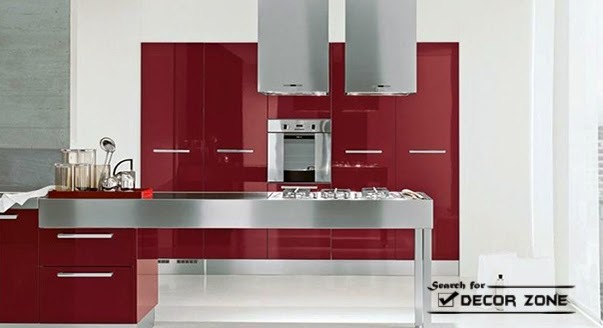 Great news for those who want to put in the kitchen a lot of home appliances - gray fridge, oven, microwave, dishwasher and washing machine - all this can easily fit with red kitchen cabinets. 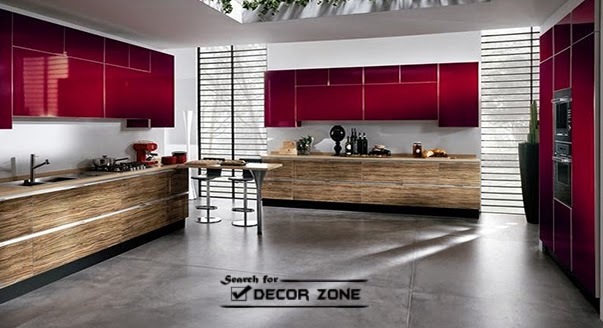 If you plan to do kitchen design with gray walls, choose the lightest shades. 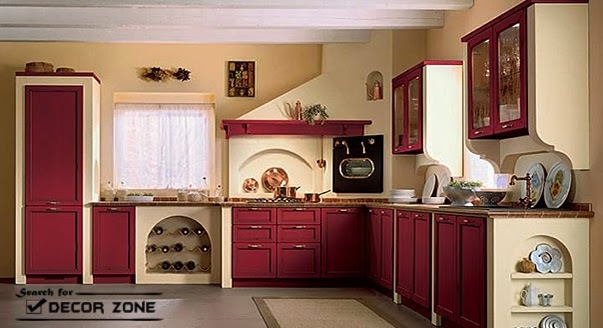 Dark walls can suppress emotion red kitchen cabinets, and it will make it less visually, so I would not advise you to do this kind of design in the design. But if the kitchen is combined with living room, then this option is fine.